At C.A.T.E., we offer a nice selection of specialized computer products. We buy and sell in the categories of telephony, high-end servers and network storage. 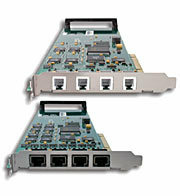 In our Online Product Catalog: You will find products such as Dialogic, Brooktrout, NMS, & Eicon Diva telephony boards; Wang systems & peripherals; hard drives, networking equipment. For more information on the products we carry and are looking for, please contact us. If you have non-working telephony pcb printed circuit boards we may be interested in buying them or you can have them repaired with us.